This candle works amazing! 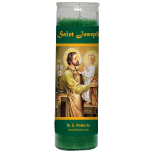 I asked for a St. Joseph's candle to be lit to finish up negotiations re the selling of my house. Asked St. Joseph to have the buyer accept my counteroffer and be done with it so we can start escrow. Within a day of lighting this candle, buyer accepted my counteroffer (and they had two days to think it over) with no more conditions or contingencies. I really could not have asked for a better outcome. I love Conjure Doctor's work. Their team (especially Mama E) are wonderful, caring people. Date Added: 03/02/2018 by L. H.